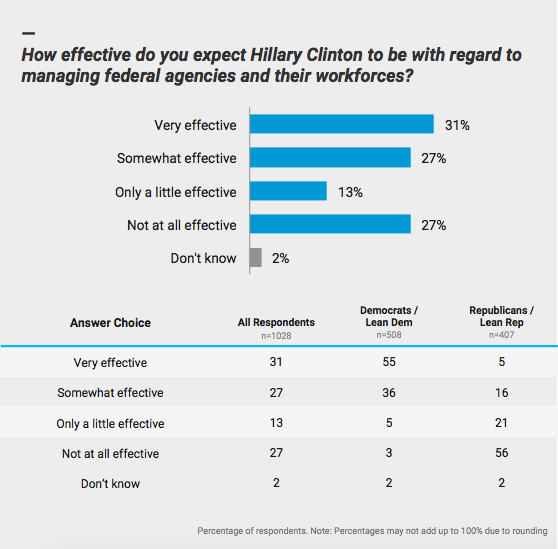 Federal employees think Hillary Clinton would be much more effective in managing agencies and their workforces than Donald Trump, according to a new survey, though it is not the issue that is likely to drive their final vote. Just 35 percent say the same of Trump, while 51 percent predict he would be “not at all effective.” Eighty percent of Democratic-leaning feds said Trump would be ineffective in managing federal agencies, while 56 percent of Republicans said the same of Clinton. Federal employees do not overwhelmingly believe either candidate would bring transparency to government. 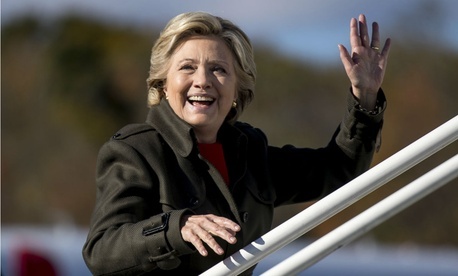 Still, more respondents said Clinton, who has been persistently nagged by accusations of skirting federal record retention laws through her private email server while at State, would run a transparent administration. Forty-seven percent of respondents said Clinton would be somewhat or very committed to promoting government transparency, compared to 38 percent who said the same of Trump. Government management issues will not likely weigh significantly on federal employees minds as they cast their votes next month; just 68 percent of respondents selected federal workforce issues as very important or essential in selecting a candidate. By comparison, the top issue for feds was national security and foreign policy, 92 percent of whom ranked it as very important or essential. Federal employees also rated economic policy, health care, immigration, gun control/gun rights, energy/environmental policy, race relations and education as more important than federal workforce issues. 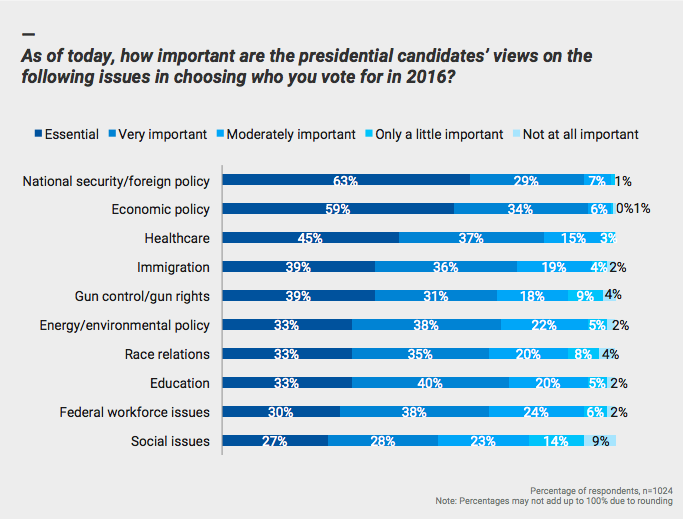 In August 2015, feds said workforce issues were the third most important issue in considering their vote. Overall, Clinton leads Trump by a 53 percent to 34 percent margin among federal employees. Government Business Council and Government Executive released the survey on Oct. 13 to a random sample of Government Executive, Nextgov, Defense One, and Route Fifty subscribers. At least 1,085 federal employees participated in the survey, including 581 at the GS/GM-13 and above grade levels and 31 members of the Senior Executive Service. Respondents include representatives from at least 35 federal and defense agencies. The margin of error is plus or minus 3 percent.